Intravascular ultrasound (IVUS) uses a tiny ultrasound transducer mounted on the tip of a catheter to image the interior of blood vessels. IVUS can be used to assess vessel/lumen diameter, lesion length, help determine the amount of plaque buildup in a vessel and its composition, and check to ensure stents have been properly placed and fully deployed. It can also help measure the effectiveness of balloon angioplasty or stenting during follow ups. 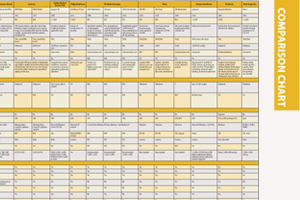 This chart has been divided into two sub charts to compare the basic IVUS system and the disposable imaging catheters each manufacturer offers. In the U.S., Boston Scientific and Volcano Therapeutics are the two manufacturers with current FDA-cleared IVUS systems. Outside the U.S., Terumo also offers an IVUS system. Volcano offers two systems, the s5 and s5i, and Boston Scientific's system is the iLab. The systems are available on a cart that can be moved around to different cath labs, or as an integrated system where a controller is permanently mounted table in the lab. Other imaging companies offer IVUS systems are sold under their proprietary names, but are manufactured by either Boston Scientific or Volcano. Both companies have partnered with GE, Philips, Siemens and Toshiba as part of their cath lab installation packages. The IVUS systems list between $100,000 and $200,000 depending if they are integrated into a cath lab system or as a stand-alone cart-based system. The disposable IVUS catheters cost about $600-$1,000 each. To use IVUS, physicians use a guide wire, usually 0.36 mm, and the IVUS-tipped catheter is then fed over the guide wire. Angiography is used to guide the IVUS catheter to the area of the vessel to be imaged. It is placed farthest away from the area to be imaged and is then pulled back through the area of stenosis. The IVUS transducers operate in the 10-20 MHz range, and the echo return is sent to an external computer so images can be reconstructed on a screen, usually displayed at 30 frames/second. The IVUS catheters use either a fixed array of mini transducers, or a single rotating transducer. IVUS has several advantages over traditional angiography. It can help better define vessels that are difficult to analyze using angiographic imaging, such as determining the lumen size of ostial lesions or areas with several overlapping vessels. Also, unlike angiography, it visualizes the atheroma and allows measurement of both the lumen and the plaque thickness on the arterial wall. Angiographs do not show remodeling of vessel walls, so the true extent of plaque buildup may not be evident. IVUS allows a cross sectional view of the artery that can clearly show the intima, plaque deposits and the remodeled lumen. Millimeter marks can be superimposed on IVUS images to accurately measure the current lumen and the original lumen size to determine the amount of stenosis and to determine what size stent is needed if the vessel will undergo PCI. An option offered with IVUS systems is fractional flow reserve (FFR) measurement catheters. The tool measures proximal and distal blood pressure around a lesion to help determine if an intervention is needed. IVUS is said to be one of the promising modalities to help identify vulnerable plaque. The IVUS system can detect variations in sound waves reflected back to the transducer created by different materials in plaque being imaged. Using a method called virtual histology (VH), an IVUS system can create a color-coded cross sectional image of a vessel showing the make-up of the plaque. Volcano said its proprietary VH IVUS technology helps differentiate the four plaque types: fibrous, fibro-fatty, necrotic core and dense calcium. One of the common IVUS complaints from doctors is the poor image quality, which they say needs to be refined further so it is easier to interpret by doctors who are not specialized ultrasound technicians. Physicians who spoke at the Transcatheter Cardiovascular Therapeutics (TCT) 2008 said IVUS needs a faster frame rate to overcome this issue. Current IVUS systems use a frame rate of about 30 frames per second, as compared to normal ultrasound systems, which run at rates between 50-750. Physicians hope future generations of the technology include faster frame rates. Proposals for future generations of IVUS includes building transducers into stent and angioplasty balloon catheters for better navigation in vessels and easier post procedure imaging. Competing intravascular imaging modalities include optical coherence tomography (OCT), intravascular MRI and near-infrared spectrometry.